3 Girls Died 10 injured duriing Atif Aslam & Arif Lahore Concert. 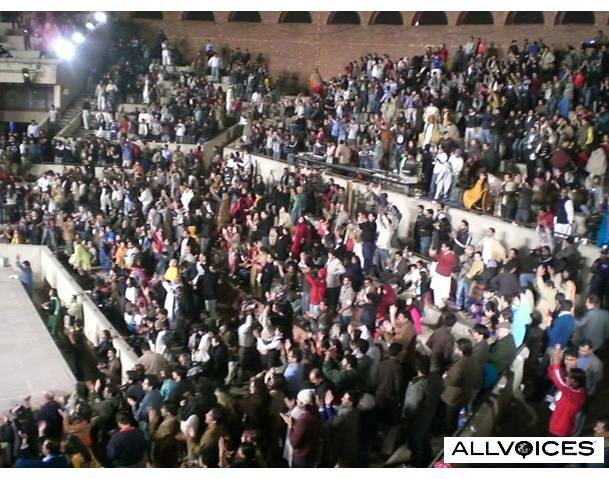 Lahore : 9 January 2012 Punjab Collage organized a concert at Al Hamra Culture Complex featuring Pakistani Leading Artist Atif Aslam and Arif Lohar.Concert was having an estimated crowd of 6000-7000 people.During the concert a terrible incident took place. Chaos caused 3 girls dead and leaving other 10 injured. The Punjab Chief Minister Shahbaz Sharif took notice of the incident and ordered an inquiry. The dead bodies has been shifted to hospitals.The actual reason for the chaos is unknown,but some experts assume that it could be due to lack of management,lack of security or the place was over crowded with more people it can accommodate. Even Atif Aslam Twitter Fan Page Posted "Such a sad news :( RT Sampede at musical show kills 3 studens,May their souls R.I.P..
We believe that Management of the concert are to be held responsible for the incident not Atif Aslam.